Once in a while we get project envy. You know, those projects that you love so much you kinda wish you could get to call the space your very damn own. 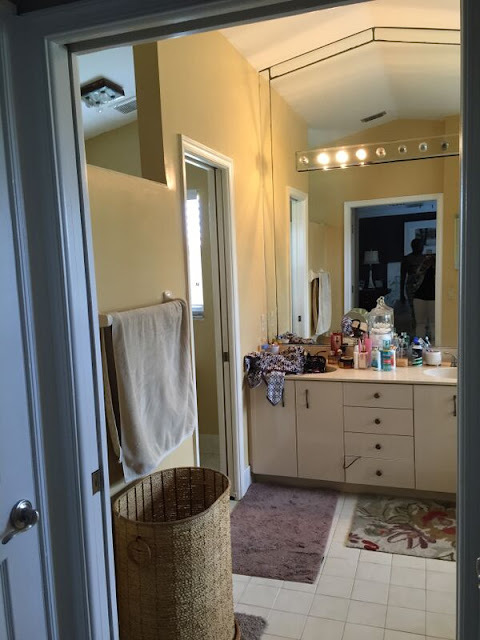 Well, that happened with this master bathroom renovation. It's come such a longgggggggg way from where it started that I often did a double-take as I wrote this post. How far? Let's take a peek. Like this to be exact. Mirrored walls, sunken tub, dated vanity, a choppy floor plan with a shower space that was just too closed off from the rest of the bathroom. The bigger offense though, was that this belonged to our very stylish client Carla, and her insanely funny husband, Bernie. 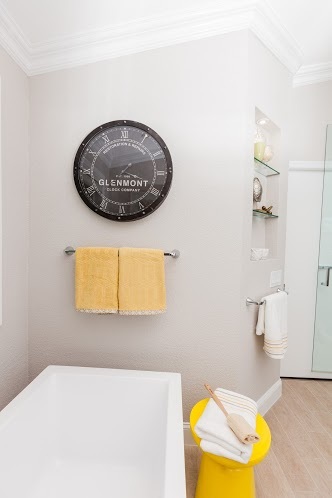 Carla has a great eye for design, and had done a great job designing the rest of their home. But she admittedly was stumped by the awkwardness of the bathroom and had simply run out of steam. 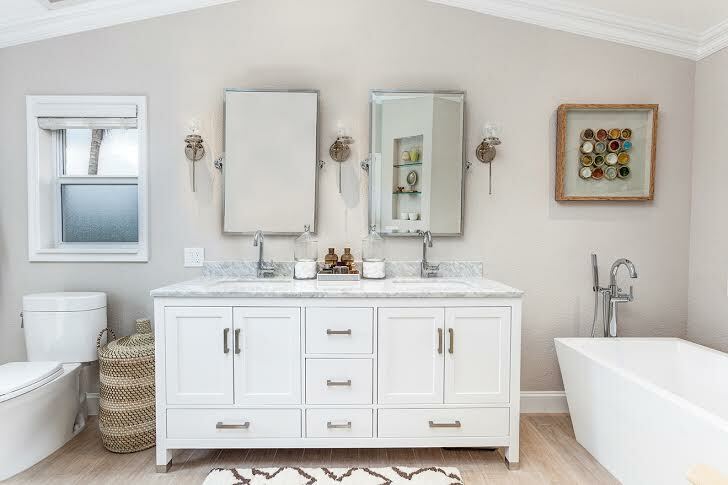 The wish list: a large shower with a rain head faucet and body sprays, a free standing tub, a double vanity with ample storage and lots of lighting. They'd also done their homework and had a very pragmatic budget in mind. 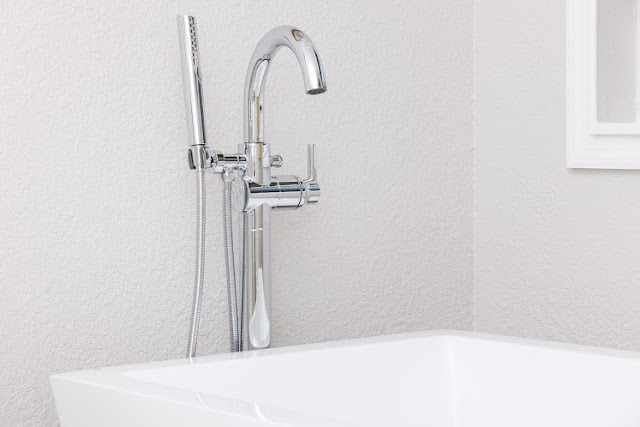 But like most bathroom renovations, that involve extensive plumbing changes we went slightly over budget. Just slightly. The plan: Remove the claustrophobic shower wall and the wall that divided the toilet area from the rest of the bathroom. 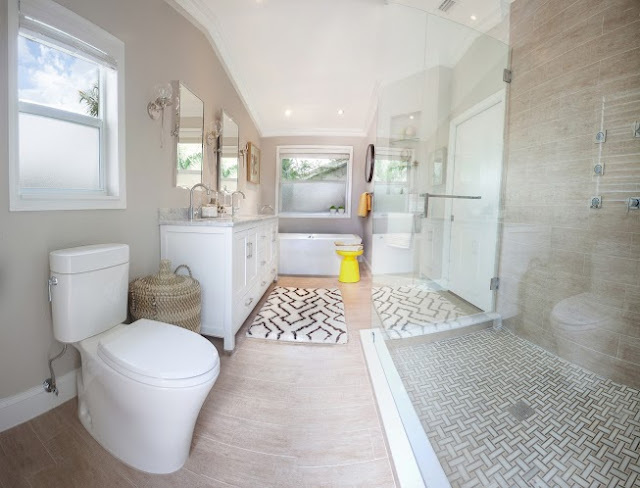 Carla and Bernie were okay with an open floor plan and wanted a seamless glass shower surround instead. 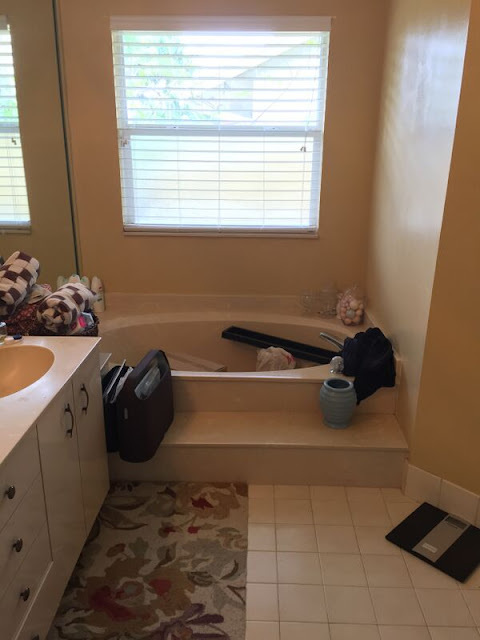 The sunken tub had to go as well, in its place a new free standing tub to meet Carla's needs. Anyway, enough chatter. Here's the complete reveal. 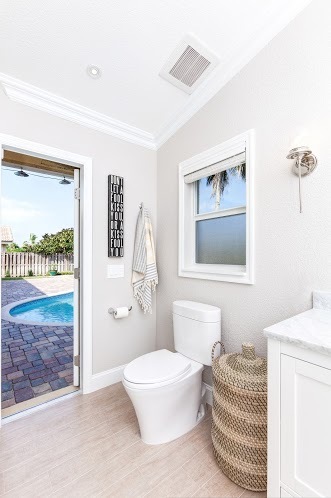 This is the view of the newly revamped bathroom from the door that leads to the pool. 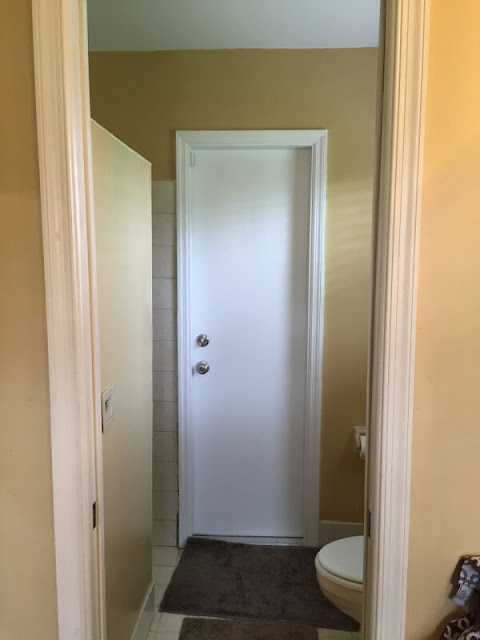 We'd debated sealing off that door but choose not to for resale considerations should they ever choose to sell. 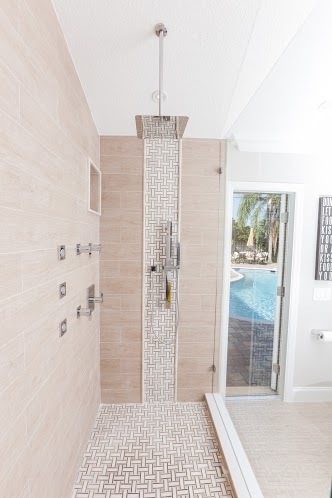 By replacing the wall to the shower with a seamless glass shower, our clients now have an unobstructed view of the entire bathroom and beyond, when they enter from the adjoining master bedroom. We chose a porcelain installed like wood flooring, paired with a basket-weave style accent tile on the shower floor and up one wall. 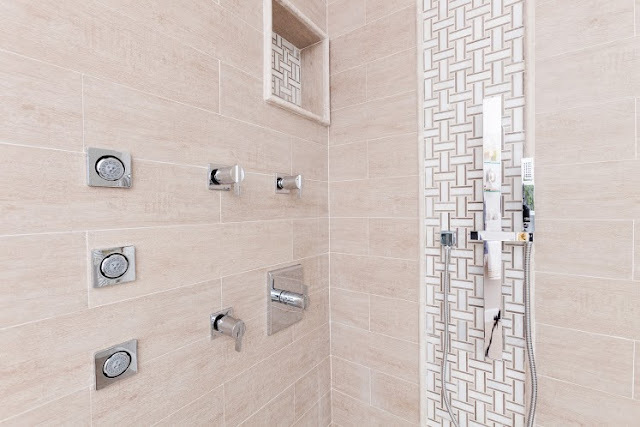 Several body sprays, a rain head faucet and handheld make this an enticing shower to linger in. 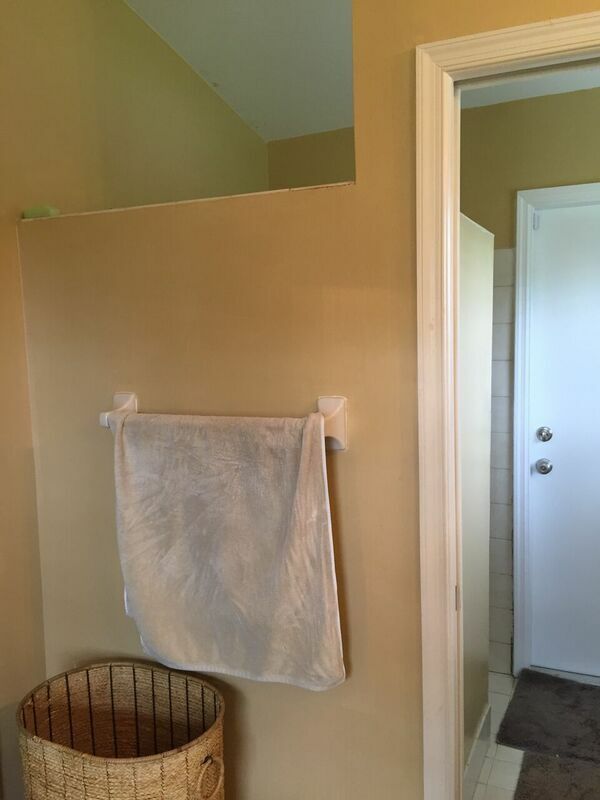 We removed the wall that separated the toilet, which really opened up the space. 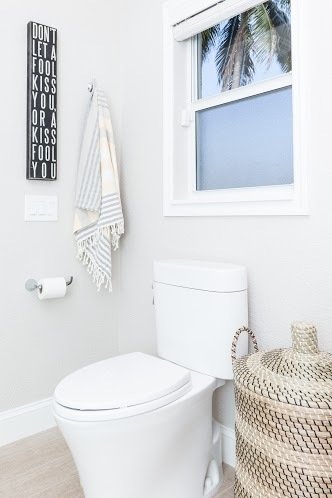 New toilet, crown molding and wood trim around the windows added some extra finish details to this master bathroom retreat. 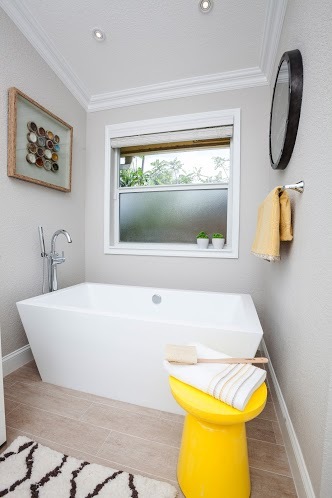 The sunken tub took an eternal vacation and made room for this free standing beauty. 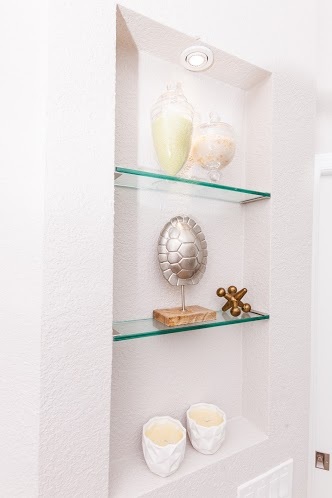 To maximize storage, we created shelving in between the studs of this wall. 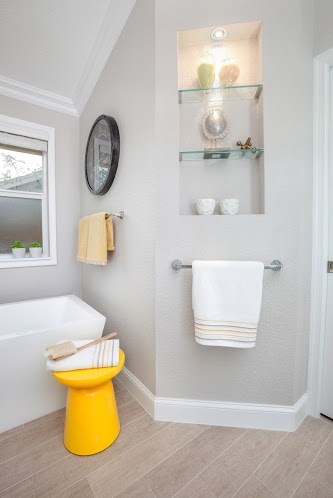 A simple and inexpensive way to use an often overlooked area. 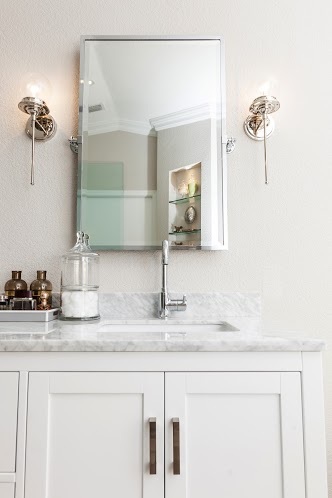 Carla may kill me for sharing this before of her vanity with it's clutter zone, so we rose to the challenge and added a vanity with loads of storage. 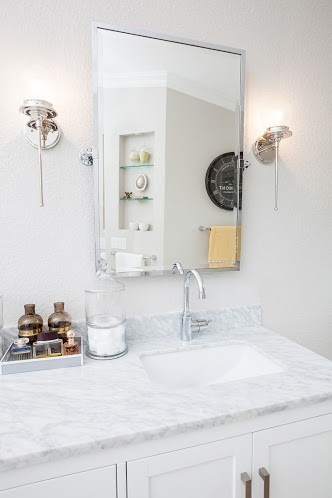 Double mirrors and sconces for additional lighting replaced the mirrored wall. And that's it folks. 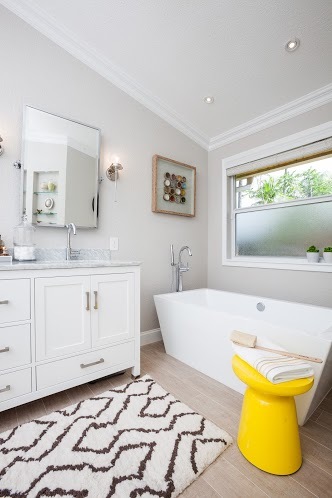 One of our most transformed bathroom renovation projects to date. It's also a great project to reflect on since Carla and I have since become friends. Always a perk when clients become like family. 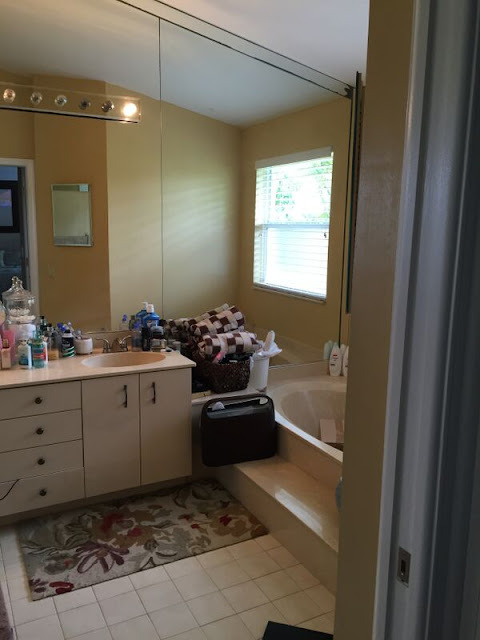 Give us a call if you're ready to transform your own bathroom. 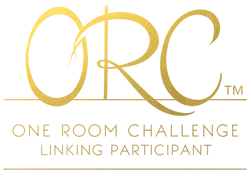 You know we love a challenge! Want to get a similar look? 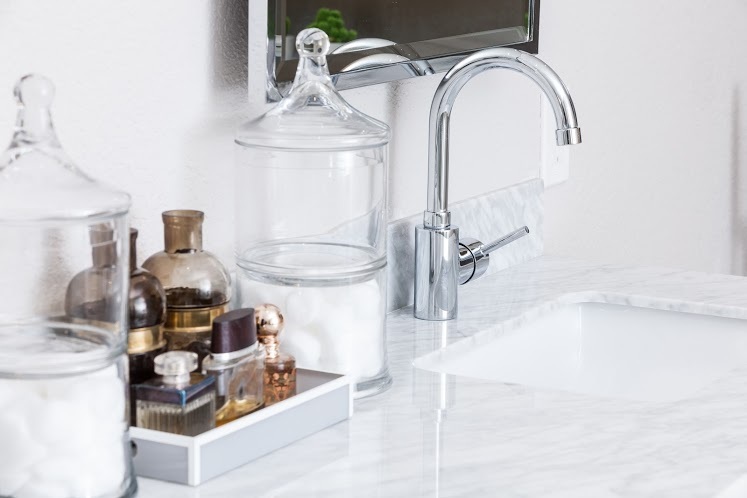 It's beautiful and we are still absolutely in love with this renovation. Nicole is just awesome. She knows her stuff y'all. Beyond gorgeous Nicole!! Just beautiful!